Is Your Personal Balance Sheet – Your Financial Snapshot – Giving You a True Picture? A balance sheet shows you at a glance what you own, what you owe, and what the difference is. The difference is your “net worth” – and the greater your net worth, the more you’re in a position to meet life’s financial uncertainties. 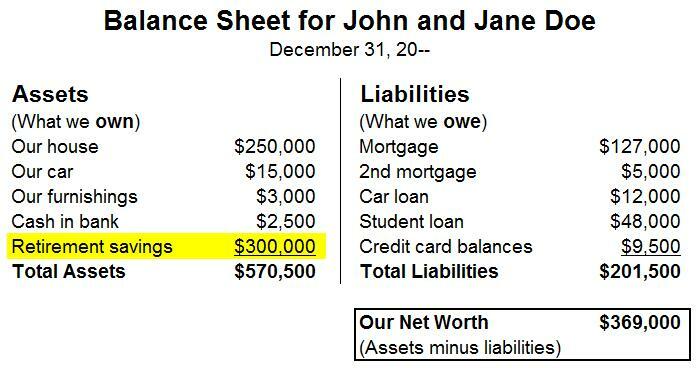 It’s called a balance sheet because your assets minus your liabilities always equals – balances – your net worth. If you owe more than you own, your net worth is a negative number, and that’s an early indication of possible financial problems or bankruptcy in your future. Is “Tax-Free Retirement” Too Good to Be True? Tax-free retirement—living a comfortable life in retirement without the obligation to pay income tax—comes as the result of planning and arranging your finances (following IRS guidelines every step of the way) so that when you retire, none of the money you receive is taxable—perhaps not even your Social Security income. Tax-free retirement is good, and this article reveals how to make it happen. Is Avoiding Taxes on Your Retirement Income Legal? Reducing or avoiding taxes is perfectly legal. People take steps to reduce or avoid taxes all the time. They may donate to charity to avoid paying as much tax. They deduct their mortgage payments. They take legitimate business deductions. They may shift medical expenses, hoping to bunch expenses into one year and exceed the threshold for deductions that year. These are just a few of the legal tax-avoiding measures Americans take every day. Many people even believe they have an IRA or a 401(k) to avoid paying taxes. But that’s a trap, because traditional IRAs, 401(k)s, and most other government-controlled retirement plans do not allow you to avoid paying taxes. They merely postpone tax day. We’ll talk more about that in a few minutes. So while avoiding taxes is legal, evading taxes is not. Maybe you don’t report your income. Maybe you take deductions you’re not allowed. Or maybe you just tell the IRS to take a hike. That’s tax evasion. But make no mistake: A tax-free retirement can be achieved legally, using IRS-approved methods. I came across an online article by an anonymous blogger who claimed that the only good purpose for whole life insurance was as a rich man’s Roth. He was certain whole life insurance was only for individuals whose high incomes made them ineligible for the tax-saving advantages of a Roth IRA. That’s actually pretty funny. Why restrict the incredible advantages of whole life insurance—including the tax advantages—only to the wealthy? Let’s look at how a Roth IRA works and then compare it to a Bank On Yourself-type whole life insurance policy. A Roth Individual Retirement Arrangement (Roth IRA) is an IRS-approved strategy that allows you to invest money you have earned by making contributions to a Roth IRA plan you have set up. You are not allowed to take a tax deduction for your contribution as you are with a traditional IRA. However, none of the money you take from your plan in the future is taxable. As far as the money in your Roth IRA is concerned, you will not be affected by future changes in the tax rate. Roth IRAs are quite different from traditional IRAs. With a traditional IRA, your contributions are tax-deductible. However, when you withdraw money from your traditional IRA—and you must withdraw specific percentages annually, beginning soon after your seventieth birthday—you must pay taxes on everything you withdraw—at whatever the tax rate happens to be at the time. Thanks for all the good things you are doing, Pamela. I am working with my Bank On Yourself Advisor to set up my third policy, and I am so appreciative of her guidance and expertise. She has been tremendously supportive. The real “snake oil” is all of the purported advice about savings and investing we have been fed by the “experts” in the past. I get so upset by the advice to invest with before-tax dollars into 401(k)s or 403(b)s.
I’m over sixty years old and know when I turn 70½, I’m going to have to take required withdrawals from my plans and have the added burden of paying taxes on them. After all, the IRS wants to get its hands on the taxes they let me avoid paying all those years. I wish not only that I had learned about Bank On Yourself earlier, but that the concept could be taught to the masses when they are young enough to get the maximum benefit from it. Here’s why I say that: I think of all of the purchases I’ve made through the years where Bank On Yourself would have been a much better means to fund them. As an example, my son’s college expenses, which I paid every cent by selling stock and mutual funds and taking a loan from a 401(k). Needless to say, my son received a great education (to his credit), but dear old dad has nothing to show for it. I had to put money into the stocks, 401(k), and mutual fund, so I had the resources—which could have been so much more powerful in a Bank On Yourself policy! It’s as simple as that. If I had done that, I would now still have the policies, which would have even more value. I am depleting an IRA to fund my third policy and to help fund my first two Bank On Yourself-type policies. I just hope I live long enough to enjoy all the benefits. One of the biggest selling points of 401(k) and IRA retirement plans is that the money you put into them isn’t taxed right away. Bring out the bubbly to celebrate, right?! First of all, some people – hopefully not you! – mistakenly believe money placed into these retirement plans is “tax free.” It isn’t. It is “tax deferred,” meaning that you will pay tax on that money when you withdraw from your retirement plan down the line. Deferred taxes might sound good, but deferring your taxes is like putting off a visit to the dentist. The problem compounds and will only get worse. First, what will the tax rates be when you retire? And what will they be 20 or 30 years later?